Population balance equations (PBEs) express models for evolution of a system of entities, called particles, due to particle creation, destruction and modification. Classical settings include physical particles like soot, crystals or even water droplets. In such settings the PBE captures the net effect (balance) of processes like nucleation, dissolution, coagulation and particle removal due to sieving. PBEs are not restricted to particles, they are also useful when considering certain questions about genes, or cells, or even where the population is a herd of animals. If particle interaction like coagulation is contained in a population balance equation, it turns into an integro-differential equation, which brings specific numerical challenges. Even more challenging are systems, where particle-environment interaction is included in the model. In the case of physical particles this includes, e.g., particle growth, particle transport and surface reactions. If the environment itself is influenced by interactions with particles, it is subject to a set of partial differential equations in its own right. Combining these with the population balance equation for the particles gives rise to population balance systems (PBS), and those are a main research topic at WIAS. Especially for classical fluid-particle systems as do appear in chemical engineering, WIAS develops, implements and analyizes fast solution algorithms and assesses their quality in terms of stability, computing time and range of application. By applying such algorithms to the modelling and simulation of scientific experiments, Weierstrass institute bridges the gap between theory and application of PBS. Several in-house codes developed with national and international collaborators were applied succesfully to that task: ParMooN, its predecessor MooNMD, and the Brush particle solver. 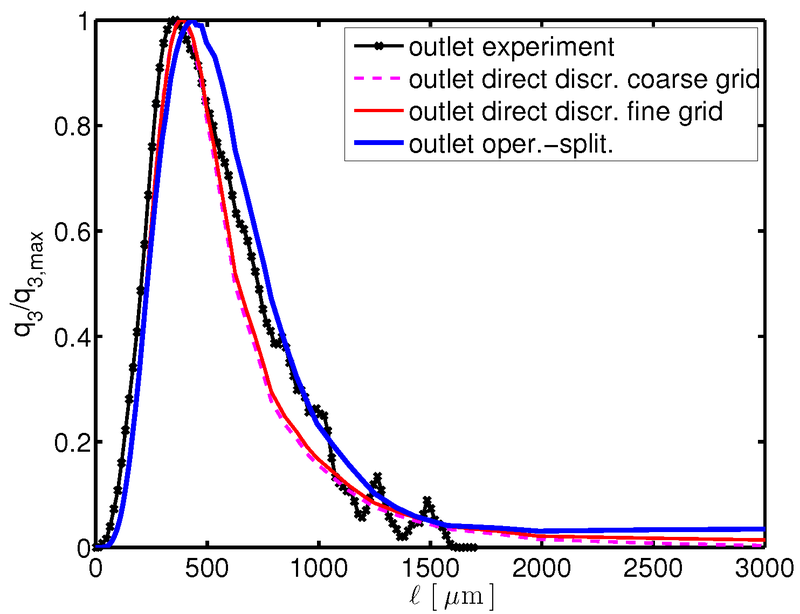 Figure 1: Three snapshots of the density distribution of water droplets at the outlet of a turbulent flow channel, numerical simulation. Real world and experimental cloud droplet growth is a wide application area for population balance systems. comparison of QMoM and FEM approaches with regards to the PBE. Solving a PBE can be a very challenging task. Depending on the dimension of the spatial domain (external coordinates) and the number of properties of the particles (inner coordinates), one can easily obtain very high dimensional problems. To counter this effect a number of methods and order reductions can be applied. For example in an axisymmetric 3D spatial domain, one can reduce the overall complexity by performing computations on a rectangular 2D domain and applying disk integration. Often operator-splitting methods can be applied, but these might not be the best performing schemes. These and similiar methods are assessed and compared regarding their accuracy and efficiency with data from laboratory experiments. Figure 2: Comparison of the accuracy of different numerical methods in approximating the distribution of urea crystals at the outlet of an experimental tube crystallizer. A novel approach combining stochastic particle simulation and PDE numerics is applied to the modelling and simulation of an ASA flow crystallizer. A saturated solution of ASA in Ethanol is pumped at low velocity through a long thin tube. The flow transports undissolved ASA particles, cooling at the walls leads to supersaturation, which stipulates particle growth. In addition, particle coagulation leads to bigger aggregates . Flow crystallizer devices are used in the industry for the production of crystals of very regular size and shape, which is necessary, e.g., in pharmaceutical production. In the simulation algorithm employed, the stochastic population balance solver Brush is coupled to the finite element solver ParMooN. Results in 2D (outer coordinates) and one inner coordinate are promising and it is intended to tackle 3D problems with higher internal coordinate space in the same way. Figure 3: Snapshot of a coupled simulation of an ASA flow tube crystallizer. bulk temperature in K. molar concentration of ASA. Solid ASA particle mass concentration, gained with stochastic solver Brush.